Volkswagen Assistance Recovery covers VW vehicles up to 12 months (Phaeton and Touareg - 3 years). Watch our "How to" find out about your red VW dash warning light video or scroll down for a static display. BRAKE SYSTEM - This warning light will illuminate if the handbrake is applied - this is a normal function. If the light is on and the handbrake is not applied check the brakefluid level. 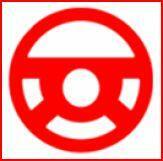 Top up if required and then book into a VW workshop as low fluid can indicate brake pad wear. If the light is still on and the fluid level is correct - DO NOT DRIVE as the brakes may not function correctly. ENGINE COOLING SYSTEM - Indicates excessive engine temperature or low fluid level. SWITCH OFF THE ENGINE AND DO NOT RESTART. An experienced person only may check and top up the coolant. DO NOT open the expansion tank or radiator cap when the engine is hot due to the risk of personal injury. Arrange a specialist inspection of the engine and coolant system. ENGINE OIL PRESSURE - SWITCH OFF THE ENGINE AND DO NOT RESTART. Low oil pressure will cause damage to the engine. Although this warning may be an electrical fault, DO NOT DRIVE until a VW Techician has carried out a diagnostic check. 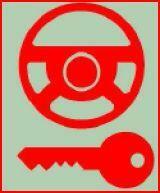 POWER STEERING - Can indicate the failure of the power steering system. Switch off the ignition for at least 30 seconds. If the light has not gone off - contact a recovery agent. AIR BAG & SEAT BELT SYSTEM - Indicates a fault in the airbag or seat belt functions. Drive with care to your local Volkswagen retailer. 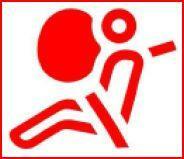 Be aware that the airbag may not deploy in the event of an accident. VEHICLE CHARGING SYSTEM - Alternator or other charging fault. Battery may discharge when driving and cause the engine to stall when travelling and not restart. Proceed with caution to your dealer. 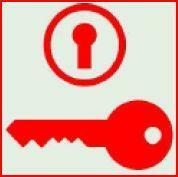 IGNITION SWITCH - Ignition switch fault. Turning off the igntion may prevent the vehicle starting again. Drive with caution to a VW retailer. SEAT BELT - This warning appears if the drivers or passengers front seat belt is not secured. It may appear with an audiable warning. For drivers travelling alone - ensure goods or luggage is not stored on the passenger seat as this will set off the warning. For any other fault contact a dealer.